Pull up a photo of the Vancouver skyline and you are greeted with an image of slender towers rising toward the sky with snow capped mountains beyond and mirrored in glassy water below. People don’t seem to mind this style of density as many, myself included, believe it’s urbanism done right. Vancouver is rightfully lauded as an urban planning success. The city is able to balance density with livability; Vancouver is the 4th densest city in North America while offering walkability, plenty of public open space and a variety of transit options. The housing typology that is largely responsible for this type of urbanism is the “pin” or “point” tower that has defined the Vancouver style. These towers are quite slender in proportion, feature articulated facades and have compact floor plates, often under 7,000 square feet (SF). Smaller floor plates increase the feeling of separation between towers, which increases the sense of privacy and allows for territorial views. Tower separation is actually mandated in Vancouver (80′ minimum) and this is achieved in large part thanks to the small floor plate sizes. In comparison, towers in Los Angeles tend to be rather, well, chunky (to use the proper architectural term). They are more squat and massive in appearance. And there is a good reason for this: they actually are more massive. Towers in Los Angeles tend to have significantly larger floor plates than those in Vancouver and US cities that have embraced high-rise design. The primary reason for this isn’t differences in land use or zoning codes. It’s mainly building code and fire department regulations that require additional floor area be added to the core of the tower. In addition to making our towers more bulky, this added floor area increases construction cost and reduces affordability. Beyond increased cost, one could argue that the desirability of some units is being compromised. As neighborhoods like Downtown and Hollywood continue to fill in, towers with larger floor plates don’t always have as much spacing as might be desired. Units located above an alley might be separated from another structure by as little as 20 feet. 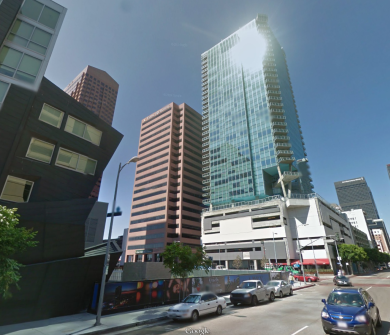 The Watermark Tower in Downtown Los Angeles, with unit windows +/- 35′ from a commercial office tower. Recent changes in the LA high-rise code do away with the helipad requirement, and will allow for more interesting caps to our high-rises in the form of spires, tapering floor plates, and so on. But this change isn’t going to give us pin towers, nor is it going to usher in an era of more affordable high-rise living. To do that, we will need to re-examine what design elements are necessary in the central core of the tower. However, these requirements do provide additional degrees of safety. Can we better balance safety with desirability and affordability? The key to high-rise design is efficiency. A typical floor layout is repeated multiple times, so any wasted space is magnified 20, 30, 40 times or more. Developers are typically a practical lot, and know that if too many inefficiencies are baked into the prevailing floor layout, the project won’t pencil and it won’t get built. Roughly, the key metric in residential tower design is an efficiency factor of +/-85% on a typical residential floor. That is, the net rentable or saleable area of a given floor (the total area of the dwelling units) should be close to or in excess of 85% of the gross indoor area. The other 15% consists of corridors, exit stairs, elevator lobbies, trash rooms, electrical closets and so on – also known as the core of the building. The core also contains area that is taken up by structural elements, such as shear walls that are often located around elevators, and stair shafts, which are often located in the middle (hence “core”) of the floor plate. For each square foot of area you build in the core of the building, the rest of the floor plate has to become bigger by 6-10 SF. This is why a central core that is as efficient as possible is critical to the design of any high-rise. Every modern day tower is going to need a certain number of elevators, a corridor from the elevators to the various unit entry doors and at least 2 exit stairs. Access to trash chutes and electrical/data closets located off the corridor are also pretty much universal. In a Vancouver pin tower, that’s typically it. The goal is to keep the central core as small as possible while maintaining adequate life-safety standards. Minimizing the floor area of the core keeps the rest of the floor plate from ballooning out further than needed and this is what creates the iconic pin tower. Thanks to this approach, Vancouver pin towers are able to achieve floor plate efficiencies in excess of 85% and, in many cases, close to 90%. There was a conscious effort to pair building code standards to desired planning and land use outcomes. This required a critical look at what provisions of high-rise building codes are truly necessary to maintain life safety. Vancouver has adopted their own building code (the City of Vancouver Building By-Law) that is modeled after the provincial and national building code, but with some key changes to better accommodate efficient high-rise construction. But the City of Los Angeles requires more. Los Angeles requires that elevator lobbies on each floor be separated from corridors, that the two stairs be separated and that access to each stair must also include a separate vestibule from the corridor before you reach the stair itself. Trash and recycling chutes must be accessed from a room that is separated from the corridor by a fire-rated wall. This is thanks to the desire to control the spread of fire and smoke from one floor to another by creating different air pressurization zones, and to provide disabled residents with an area of refuge. Much like the helipad requirement, these provisions are there to provide an added level of fire safety, but they do require additional floor area, and thus additional cost, to accommodate. And once floor area in the core is added for these elements, the cost of construction plus associated soft costs are usually passed on to residents. You will notice that in the Vancouver tower on the left, the elevators empty immediately into the corridor and the scissor stair (two stairways that stack above one another in the same enclosure, but are separated with fire-rated construction) without entry vestibules. 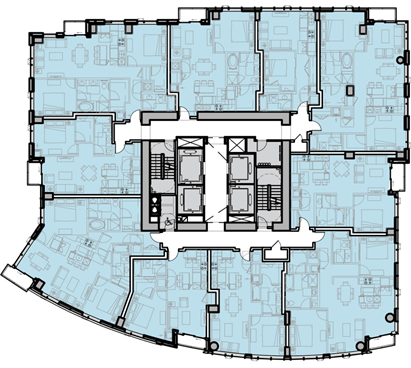 In comparison, much more floor area is given to circulation in the Los Angeles tower. The elevator lobby is its own fire-separated room and the stairs are separated into two enclosures with entry vestibules. There is a separate room before accessing the trash and recycling chutes, which are located directly off the corridor in the Vancouver tower. There are some similarities between the two towers: both are located in seismic zones and provide lateral force resistance through similarly thick concrete shear walls, and both towers have similarly sized elevators. 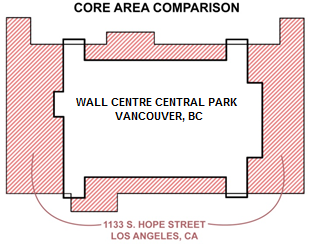 The building and fire code provisions of LA lead to a core that is almost twice as large in area, including cross-sectional areas of shafts and hoistways, than the Vancouver tower – 2,065 SF vs 1,080 SF. Two other things to point out: first, the efficiency of each tower. 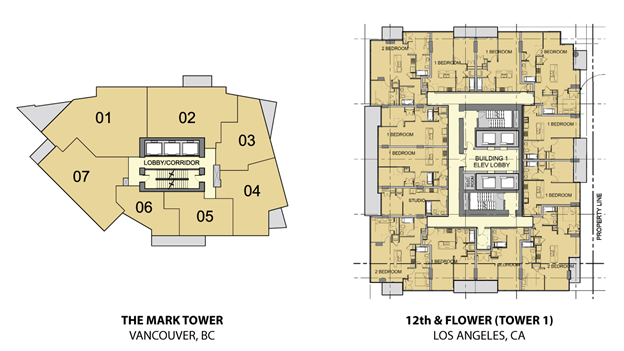 If the LA tower was to match the efficiency of the Vancouver tower, the gross floor area would have to grow to nearly 16,600 SF. Second, and more importantly from a housing affordability standpoint, the cost of constructing the extra floor area is passed along to tenants. Assuming a construction cost of $300/SF of built floor area (i.e. not including shaft areas), that’s an extra $28,000 per unit on the floor, to accommodate an additional 951 SF of circulation area serving the same number of units. Another interesting aspect is that the Vancouver project features much smaller average unit sizes: 636 vs 819 SF. This was likely more of a market-driven choice that wasn’t solely dictated by building code factors, but there are code-based influences to having smaller floor plates. Assuming a sales price of $600/SF, which isn’t far off of market conditions in both cities, that’s a difference of over $100,000 for an average-sized unit, before you take into account the additional cost for the added circulation areas. There are aspects to the building code (such as disabled access clearances in bathrooms and kitchens) and planning code (open space and parking requirements) that make smaller units cheaper to build. While this might be worthy of a separate post, requiring more area of the floor be dedicated to non-revenue uses does have an influence on unit size. Another good comparison would be to look at two residential towers by the same developer. Onni is one of the largest developers in Canada with a portfolio of over 5,000 completed units and another 4,000 in the pipeline. They recently moved into the LA market and are in the process of constructing three separate towers: 888 S Olive (32 stories, under construction), 820 S Olive (50 stories, going through permitting) and a twin tower project at 12th & Flower (40 & 32 stories, also going through entitlements). Onni recently completed a 47-story tower, The Mark, on a corner lot in the popular Yaletown neighborhood of Vancouver that provides a good comparison to the 12th & Flower project in LA. I was able to scale the plans of the development permit application for The Mark tower and cross check it against marketing information and overall site dimensions (this is always a challenge, but I believe I was able to adequately scale the drawings so that the overall floor plate dimensions are accurate within 1 or 2 feet and areas represented are within +/- 1%). The quality of the development application plans were difficult to read, so I redrafted a typical floor layout to generate area data. Again, Los Angeles has the added elevator lobby, separated stairs with vestibules and a trash room. With this added area, it becomes necessary to run the corridor around the perimeter of the structural core which adds even more floor area to circulation. The added circulation area requires a larger floor plate to get to an efficiency ratio just above 80%, which then causes even longer corridors to reach further into the enlarged floor. With the floor plate becoming larger, you start chasing inefficiencies by forcing more circulation area. This isn’t a result of an inexperienced developer trying out high-rise residential construction. This is a developer with a proven record of creating thousands of units in efficient towers elsewhere. Somehow, Vancouver has determined that their high-rise towers are safe enough without these additional building core elements. They made it a point to only require what they felt was truly necessary for life safety, and removed elements from the building code that might add significant cost. It’s worth acknowledging that Vancouver is in a different country with a different set of laws and building codes. As mentioned above, Vancouver uses a modified version of the British Columbia Building Code which is based on the National Building Code of Canada. Most of the United States has adopted the International Building Code (IBC) as a model code to follow, with individual states and cities making edits to the IBC where they see fit. California has adopted a modified version of the IBC as the California Building Code (CBC) with Los Angeles adding its own amendments to the CBC. So Vancouver and Los Angeles are starting from different places and that does drive some of the differences. But other US cities that have embraced high-rise residential design have building codes that look much more like Vancouver. For a good example, you just need to drive about 2 hours south. Like Los Angeles, Seattle uses the International Building Code as a model code with specific amendments. However, the city government of Seattle has made a conscious effort to amend the code in a way that encourages dense infill development in areas they have dubbed “Urban Centers,” which are mostly located in downtown and first ring neighborhoods. They are also actively working to encourage development of dwelling units to keep housing affordability in line during a time of strong job creation and an influx of new residents. Over the years, the city has adopted specific amendments to the high-rise provisions of the IBC to eliminate separate elevator lobbies and stair vestibules, provided that hoistways and stairways are pressurized, and the requirement for separate trash rooms. However, unlike Vancouver, they do not allow scissor stairs, which would save additional space inside the core (most US cities don’t allow scissor stairs, with New York being an exception). Even without the allowance of scissor stairs, there are significant differences in the size of the core when comparing a residential tower in Seattle and one in Los Angeles. Below is a typical floor plate of a tower that is about to begin construction at 9th & Lenora in the South Lake Union neighborhood. In my opinion, SLU is the Seattle equivalent of South Park. When comparing projects between these three cities, noticeable tends begin to emerge. I selected a handful of projects in Vancouver, Seattle and Los Angeles, either proposed or recently completed, that shared similar infill sites close to downtown cores. All cities do a decent job of posting PDF drawings that are easily scalable. I believe that the towers I chose are representative of what is currently being built in each city. 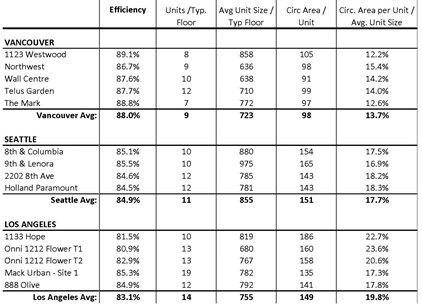 Going beyond the obvious, that cores are larger in LA, note that even as the gross floor areas expand, three of the LA projects don’t reach the 85% efficiency mark. For the two that do, the Mack Urban tower uses a significantly larger floor plate to reach 85%, and the 888 Olive tower uses an offset core and loads most of its units to one side of the floor. I’m honestly a little surprised to see towers with relatively low efficiency ratios going forward. I think this is due in large part to atypically high rent and sales price growth in Los Angeles. The cost of building added circulation area is getting passed on to tenants and, in this area of reduced housing supply, there are some capable and willing to pay more. But there is likely a limit to the number of people who can afford rents of $4.00/SF and up. Once this limit has been reached, it wouldn’t surprise me if other projects didn’t move forward unless they improved on efficiency ratios. This would further starve LA of much needed housing supply. It’s worth noting that the average unit size of the Seattle projects is the largest, with the 9th & Lenora project skewing things a bit). Based on my experience, this is historically atypical, as Los Angeles tends to have larger average unit sizes than Seattle and Vancouver. A large factor is that the LA projects are all located in the Downtown Parking District, which only requires one parking stall for most units and can be further reduced by providing bike parking. Additionally, projects in Downtown LA do not have unit density limitations, they are only FAR constrained. This allows developers to provide more, smaller units than in other parts of the city, where 1.5 or 2+ cars per unit are required for anything above a studio and unit density limitations come into play. Note how much larger the circulation area needed relative to the average unit area (the lower right corner) is for Los Angeles. The LA projects have an additional 19.8% of the average unit area dedicated to circulation, while it’s only 13.7% in Vancouver and 17.7% in Seattle. This relationship would only get worse if LA started limiting overall floor plate sizes or requiring tower separation, something Vancouver and parts of Seattle require. It’s not outrageous to suggest that an additional $20-40k is already being added to a typical high-rise unit in Los Angeles thanks to building code provisions alone, before considering other factors such as parking requirements or drawn out environmental reviews and appeals. So are residential high-rises in Vancouver or Seattle less safe than those in Los Angeles? Should LA modify its requirements? It’s a complicated subject to tackle and I couldn’t do it justice in a short post. I do believe that it is important to understand the cost implications of these requirements, and why other cities often require less. Vancouver and Seattle are in active seismic zones with the potential to deliver large earthquakes, like the 6.8 magnitude Nisqually quake in 2001. On the other hand, Los Angeles is subject to greater ground acceleration per the IBC. Fire sprinkler, alarm, and detection system requirements have come a long way in recent decades and this has reduced number of high-rise fires and associated deaths (both down nearly 50% since 1985), which might allow for building code amendments. The City of Los Angeles is in the process of reimagining the zoning code and neighborhood plans, known as re:code LA. They are scheduled to unveil a new Downtown zoning code in 2015. This code will likely include a number of requirements for high-rise design, which may carry over to high-rise design in other parts of the city. Many cities, like Seattle, that have recently revised zoning code standards have included provisions for tower spacing and floor plate limitations. Ideally, any proposed high-rise zoning changes in LA would be done in tandem with a review of high-rise building and fire code requirements that affect building floor plate sizes. Limiting overall floor plate sizes while keeping provisions that lead to larger cores would only make efficiency ratios dip further, which could lead to fewer units being delivered to an undersupplied market. A review of the code shouldn’t be limited to fire & life-safety provisions. Any truly comprehensive review of the code would look at all requirements that drive costs and effect affordability, such as parking minimums. Beyond potential zoning code changes, the city should look at the building code to identify what provisions truly make an impact in fighting fires and saving lives versus what might needlessly be adding costs without much or any real benefit. In the meantime, don’t expect to see pin towers dotting the LA skyline. Maybe we can learn to love our chunky Angeleno towers. This entry was posted in Uncategorized and tagged Affordable housing, building code, fire code, High-Rise on February 9, 2015 by letsgola. Very illuminating post, thank you. Regarding that other post you proposed writing about the smaller unit sizes in Canadian high-rises: yes, please! I’ve long wondered why there seem to be so many smaller units built in tall towers north of the border (Toronto as well as Vancouver.) Is it code differences, like you suggest? Different market segments? Anyways, seems to me that the huge (and therefore expensive) units that seem to predominate in US high-rises hampers affordability and is probably also holding down high-rise development (just like you pointed out with the larger cores in LA). An interesting discussion of building codes for the upper levels. However, “pin towers” are the bane of urban life at the ground floor: they produce the horrible tower-in-the-park[ing lot] effect that destroys all urban life around it. This must be avoided. So while we have our head in the clouds, let’s not forget about the ground level that makes residential tower life worth bothering with in the first place. What’s the point of living in a high rise if you have to drive everywhere anyway? Having some wider buildings that interact with the sidewalk is crucial. Maybe even if it’s just the base of a tower. The ground floor should not be setback more than 10 feet, and preferably less, with retail. That’s exactly how it’s done in newer Vancouver towers: skinny tower with a large (usually retail) podium at the bottom. All these examples have cross-sections that are close to square. Do private developers not build residential towers that are much longer on one side than the other? Elongated rectangles are very common at housing projects, in addition to crosses and other perimeter-maximizing designs; they also exist at hotels, which need to pack many small rooms together, for example New York’s Sheraton, between 53rd and 54th right west of 6th, which is about 17 meters wide and 120 long. Fluor Tower on the USC campus does not have an elevator lobby, it looks more like the Vancover corridors, albeit with stairwells on the sides. the two towers going up next to 6060 Center Drive at the Los Angeles Howard Hughes center have atypical polygon floor plans akin to the Mark tower in Vancouver, they might be a good point of comparison to it. Thank you for helping out, excellent info. “If you would convince a man that he does wrong, do right. Men will believe what they see.” by Henry David Thoreau. Great post. Makes a lot of sense, great stuff to think about.